When flocks of bird nerds get together, they fill the air with stories and tails, discussions of past sightings, future sightings, ornithological taxonomical distinctions and splits, migrations, and all manner of other things that involve the esoteric jargon that comes with any serious past time. One of the more common idioms, one with which even the most casual or greenhorn birders are familiar, is the dreaded "Nemesis Bird." Some of the best birding stories, even the best birding blogs, have to do with the big misses relating to a Nemesis Bird, a bird one has repeatedly tried and failed to see. In many cases birders have multiple Nemesis Birds, and they may spend many years and dollars trying to find them. The Nemesis Bird weighs heavily on a birder's mind, influencing trips and confidence, determining whether or not one has a successful outing even quite apart from any other birds that are seen. Of course, every good story needs some sort of adversary, some sort of challenge, and the Nemesis Bird, as a concept, holds a high place in the birding lexicon and identity. Inversely, I want to posit that there is another bird, the protagonist, who may often be under-appreciated, who is less often mentioned in the stories or put on the pedestal. Enter the Hero Bird, the stoic, tragic characters(s) in many birders' lives, who saves one birding outing after another and may never get the full credit it is due--certainly none of the attention and hype that Nemesis Bird receives. 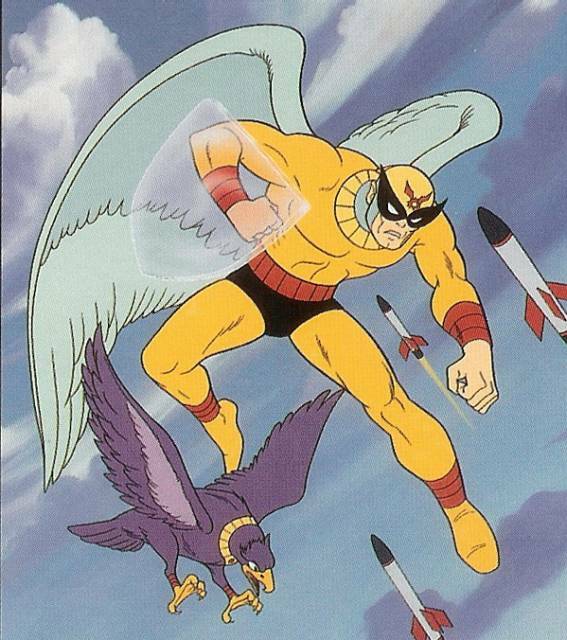 The Hero Bird is more difficult to define. It's the bird that makes the trip when the lifers or nemeses don't show. It's not so common that it's boring or blasé, but it's still a reliable and delightful find when it judiciously reveals itself. Deciding on one's Hero Bird is tricky, because the rarity if the birds must be taken into consideration as well as the other circumstances and frequency of the sightings. For example, Cardinals are always a pleasure to see, but I doubt many people would identify a Cardinal as their Hero Bird because in most locales where they're seen, they're so common that they don't serve as a singular, standout sighting. The Hero Bird must allow great looks, better perhaps than one might expect, or better than one has heard of other birders having. 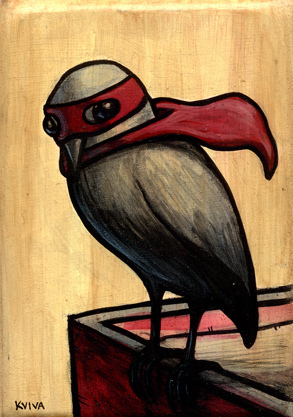 The Hero Bird makes an otherwise mediocre trip, one without lifers or super sightings, into a fulfilling adventure. The Hero Bird is not necessarily rare, nor necessarily common, but it feels like a blessing every time it's seen. Like a comic book superhero, the Hero Bird doesn't appear all the time and save the day, but it shows up often enough, or in the most desperate of circumstances. Trying to think of my own Hero Birds, at first I speculated it may be the Le Conte's Thrasher. This is an uncommon bird, one not widely distributed, and I've been able to find it every time I've tried, including several trips with out-of-state birders who've gotten in touch specifically to find that bird. It's not a guaranteed sighting and it's a local specialty, but I've always had luck with the Le Conte's. 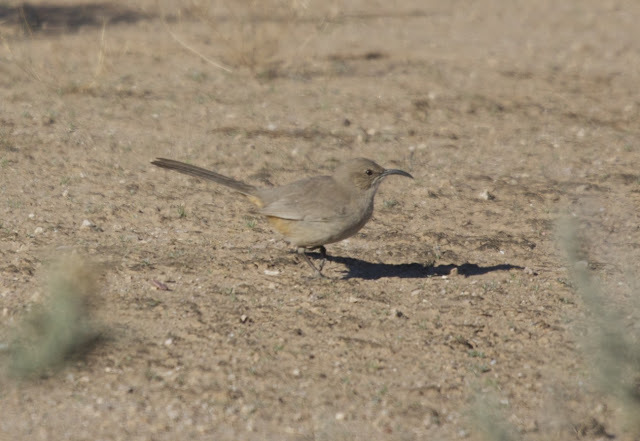 However, I've never seen this Thrasher anywhere but in the little Thrasher spot out in Buckeye. While it's a reliable sighting, it will never show up to save the day, or at least it never has, when I've been birding elsewhere in Arizona. Le Conte's Thrasher, you are a great bird, but you are not my Hero. As I thought about it more, I realized that I probably don't have the greatest Hero Birds, in part because I'm not a great birder and haven't gone on lots of great birding trips. Then, on further meditation, I realized that my two probably Hero Birds are indeed great. Bird names never lie or mislead, after all. 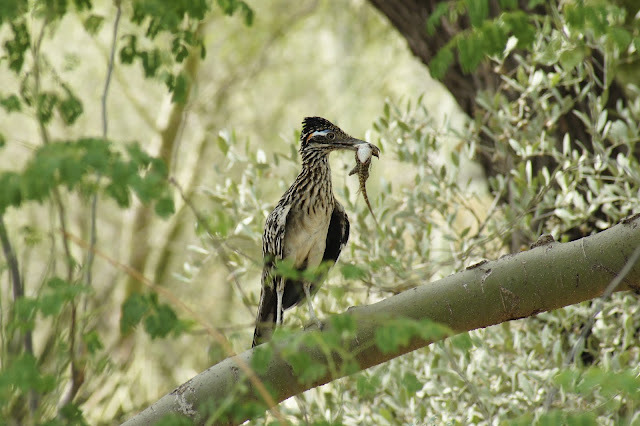 My two Hero Birds are the Great Horned Owl, and the Greater Roadrunner. These birds are big and badass, but that alone doesn't seal the deal. 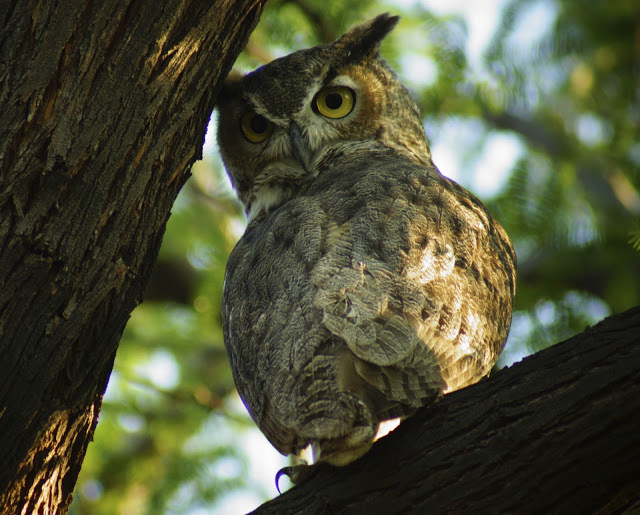 Neither the Greater Roadrunner nor the Great Horned Owl are rarities, but I don't see them every time I go birding either--it's vitally important that a Hero Bird isn't overly available, or else all the mystique is lost. But when I see them, I tend to get very close up views and good photos. 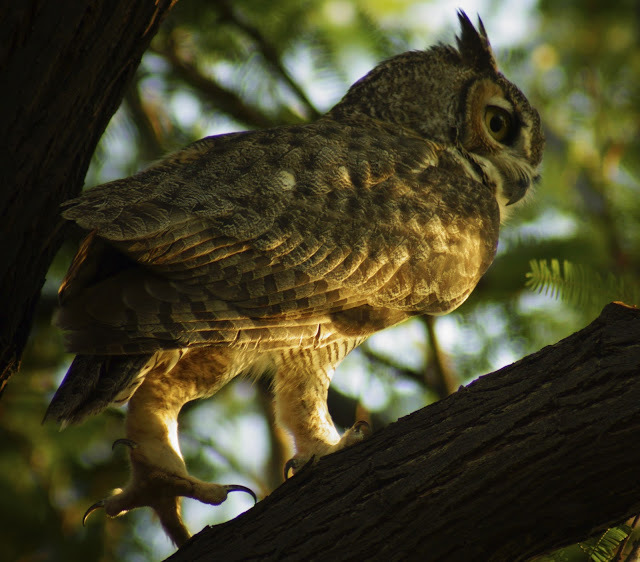 I walked under this Great Horned Owl after spending hours trying to turn up a rare reported sparrow at the DBG. I had no luck with the rare bird, nor did anyone else I talked too, but the Great Horned made the trip absolutely worth it. This isn't the only time a GHO has shown up and saved a failed chase. Owls already have a lot going for them, and a visual always has a big impact. I'd venture that many people could find the Great Horned to be one of their Hero Birds. They combine awe and availability almost perfectly. The Greater Roadrunner also happens to be one of my favorite birds. I feel satisfied with my photo collection of it, and have had some amazingly crushing views, including when a Roadrunner ran across my feet on a trail in east Phoenix, and also massacred a Mourning Dove chick mere feet away at the DBG (pictured below). Roadrunners aren't regarded as particularly skittish, but many is the birder I've spoken too who bemoans their lack of good, prolonged Roadrunner sightings. 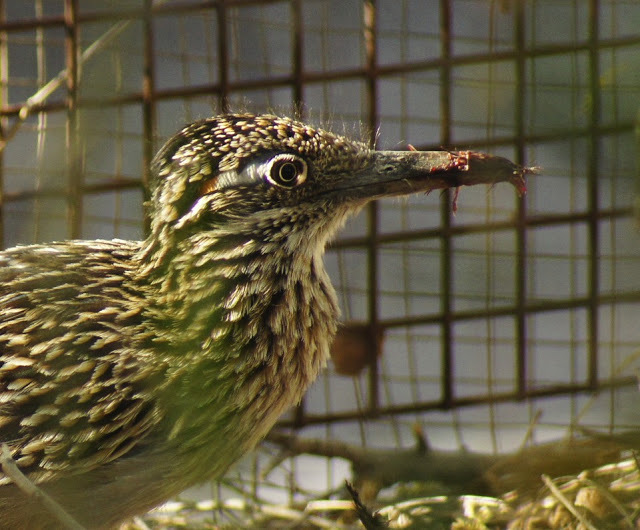 I've got 99 bird problems, but quality time with the Greater Roadrunner ain't one of them. So, do you have a Hero Bird. 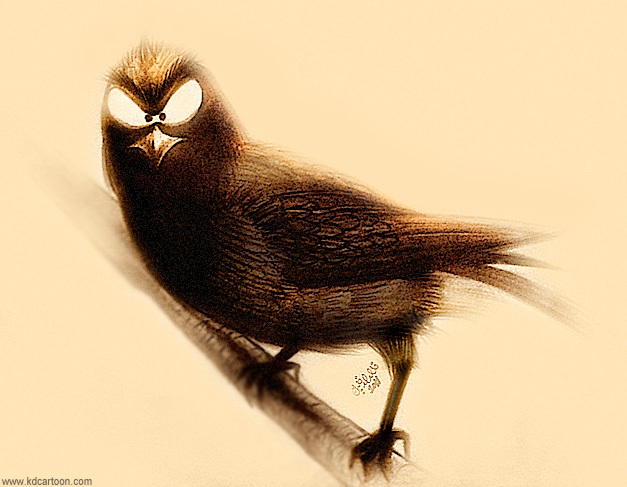 What bird has given you almost undue, face-melting looks, on multiple occasions? What bird has shown up, time and again, when it seemed the morning was over, the afternoon doldrums were setting in, and the birding trip was a bust? For many birders, finding and conquering our Nemeses Birds are some of the most defining and memorable moments. Let us also recognize the Heroes. This is a fun read, Laurence! I like the optimistic twist on the nemesis bird problem. You've changed my way of thinking. Last spring we chased a Painted Bunting in Minnesota - got a hotel room and everything. Unfortunately the weather switched the day we got to the site, and the bird didn't show. It was the Purple Finch that saved the trip. It was a lifer for us and one that we had called off the search for until the following winter. I will pay more attention to these hero birds from now on! An especially fun post! Your marvelous writing really pulls the reader in. I love your hero bird idea. I will have to think a bit on what my hero bird(s) might be. Love the owl and roadrunner photos!